Homeowners in Ford Plantation in Richmond Hill rely on American Craftsman Renovations for quality roofing services. We offer everything from patching leaks and fixing gutters to total roof replacement. Trust our roofers to get the job done the right way, the first time. 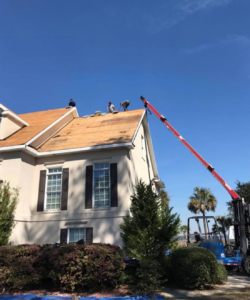 No roofing project is too big or too small for us to take on and because we have many years of experience in the industry, we are able to provide you with the best roofing services in Ford Plantation Richmond Hill. At the start of every roofing project, we will conduct a full assessment of your roof to best determine its needs. From minor repair work to total roof replacement, we have become the trusted choice for quality roofing services thanks to our commitment to quality workmanship and exceptional customer service.